Wednesday night in Serilingampaly, when TRS supporters protested that Mahakutami leaders were distributing money. Hyderabad: Unidentified persons pelted stones and damaged two cars belonging to All India Forward Bloc leaders including Mr T. Srinivas Reddy, who is contesting on the party ticket the Rajendranagar Assembly constituency. According to Mailardevpally inspector K. Sathaiah Goud, late on Wednesday night, the window panes of two cars belonging to Mr Srinivas Reddy and his supporter were damaged in the stone-throwing. It is suspected that some rival party members were involved in the incident. A case was registered on the complaint of Mr Srinivas Reddy for the probe, he said. Several incidents of clashes between the supporters of TRS and the Mahakutami were reported at several parts in the state. Prompt intervention of the police prevented them from escalating into major incidents. 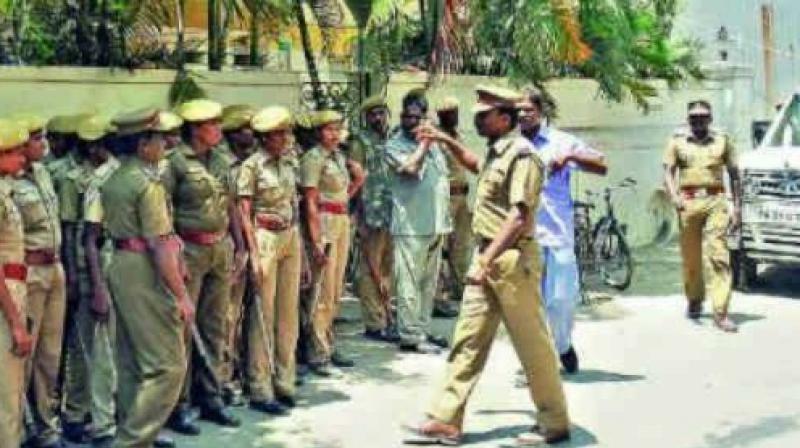 Mild tension prevailed on Wednesday night at Papireddy colony in Serlingampaly, when local TRS supporters staged a protest alleging that the supporters of Mahakutami were distributing money to the voters. Supporters of the Telugu Desam and Congress also gathered there and they all started attacking each other. The Cyberabad police who were alerted to the incident rushed there immediately and dispersed the crowds. Similar incidents were reportd at Bhongir, Atmakur, Kukatpally and Nirmal, where the supporters of TRS and Mahakutami made allegations against each other for distributing money to the voters.